Panchavadyam( പഞ്ചവാദ്യം Malayalam), literally meaning an orchestra of five instruments, is basically a temple art form that has evolved in Kerala. Of the five instruments, four — timila, maddalam, ilathalam and idakka — belong to the percussion category, while the fifth, kombu, is a wind instrument. 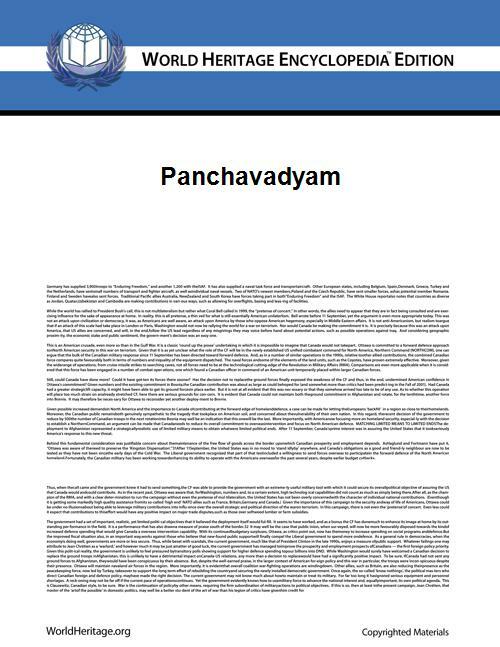 Panchavadyam is still largely a temple art, but it has come out of its precincts to be seen performed during non-religious occasions like cultural pagentry and according welcome to VIPs. There are several central and northern Kerala temples that have been traditionally playing host to major pachavadyam performances. Prominent festivals featuring them are Thrissur Pooram (its renowned Panchavadyam event is known as 'Madhathil Varavu'), Nadappura Panchavadyam at Wadakancheri Siva Temple participating to famous Uthralikkavu Vela at Wadakancheri, Kaladi Panchavadyam ulsavam, Machattu Thiruvanikkavu vela, Nenmara-Vallangi vela, Vayilliamkunnu Pooram, Pariyanampatta pooram, Chinakathoor pooram, Varavoor Palakkal Karthika vela, Tirumandhamkunnu pooram purappadu, Tripunithura Sree Poornathrayeesa Aarattu, Tripunithura Thamaramkulangara Makaravilakku, Thiruvona Mahotsavam at Sree Vamanamoorthy Temple Thrikkakara and Cherpulassery Ayyappan Kavu ulsavam, besides temples in places like Chottanikkara, Odakkali, Vaikom, Ambalapuzha, Perumbavur, Pazhur, Ramamangalam,ooramana, Nayathodu, Chengamanad, Elavoor,Chennamangalam, Triprayar/Arratupuzha, Irinjalakuda, Thiruvillwamala, Pallassena, Pallavoor and several renowned temples in Malabar like Kottakkal Viswambhara Temple and Kottakkal Pandamangalam Sreekrishna Temple and further up in Tulu Nadu. 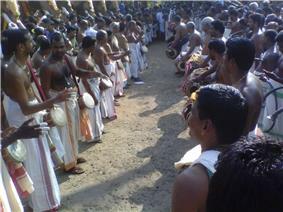 Chembuthara Kodungallur Bagavathi Temple on the first Tuesday of Malayalam month "Makaram"
Some of the known institutions that give formal training in panchavadyam are Kerala Kalamandalam and Kshetra Kalapeetham in Vaikom. In addition to the above Sri. Thrikkampuram Krishnankutty Marar himself trained many people. 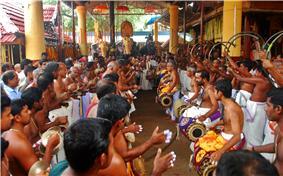 All the panchavadyam performances in Kerala will have at least one of his disciples as a performer.